Do you ever have those days where your body is craving something bu you can’t figure out what? Tamari Ginger Almonds are one of those snacks that satisfy whatever craving I am having. The combination of fresh Ginger and garlic, salty Tamari and sweet Medjool dates pretty much covers every flavor taste bud in the mouth. 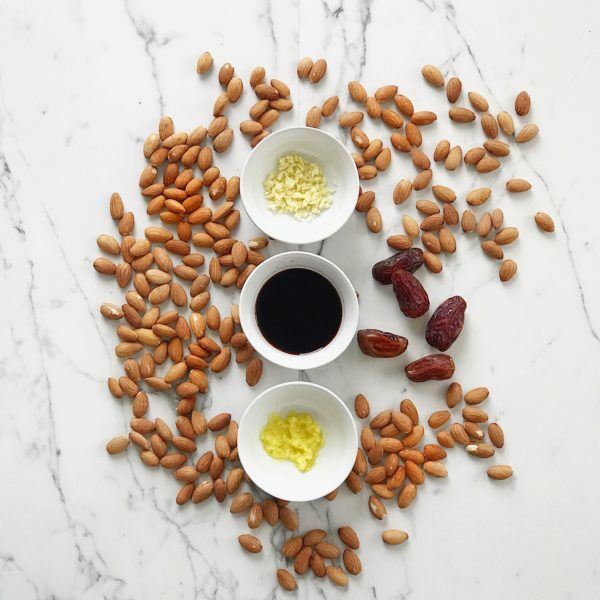 Plus you are getting a ton of nutritional benefits from just one handful of these tasty nuts. Years ago, I purchased my first dehydrator. I say first because once I discovered all of the incredible foods I could make in a dehydrator, I used it so much that I burned out the motor in only a few months. Of course, that may also have something to do with the inexpensive version of this genius invention. Since then, I have invested in an Excalibur 9-tray machine and I haven’t stopped using it to this day. 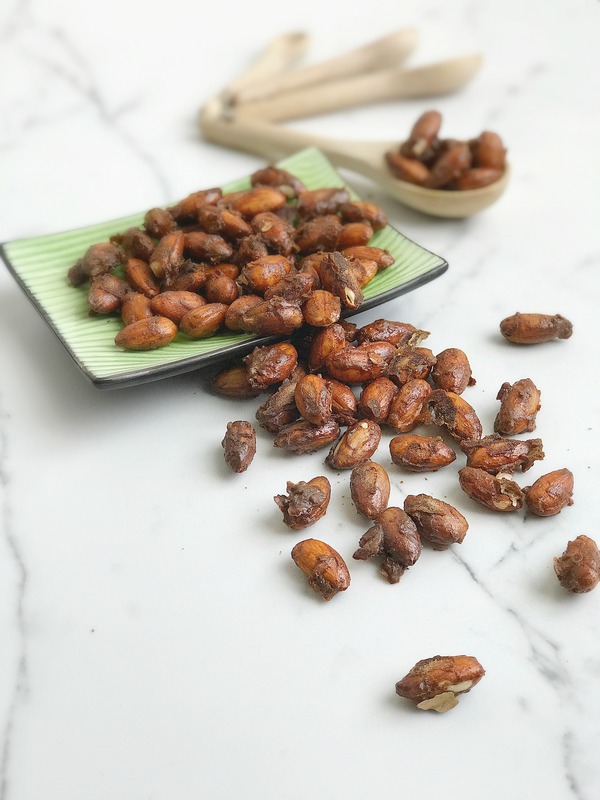 While there are so many delicious options, one of my favorite foods to dehydrate are these marinated almonds. The distinctly strong flavors of each ingredient comes through in every bite. They make the perfect snack any time of the day, and the versatility of this almond is almost endless. A few of my favorite ways to enjoy these almonds is to sprinkle the chopped almonds over a dish of green tea ice cream, toss them together with chocolate chips for a fun movie snack, sprinkle some over a salad like my Crunchy Asian Sesame Salad or Easy Asian Coleslaw or sprinkle a few of the chopped almonds over a bowl of warm winter soup like my Tlavhe Red Lentil Soup. There are so many delicious ways to eat these almonds but the only problem I seem to have when it comes to making then is that I never make quite enough. Soak almonds in water overnight. Drain and rinse well. 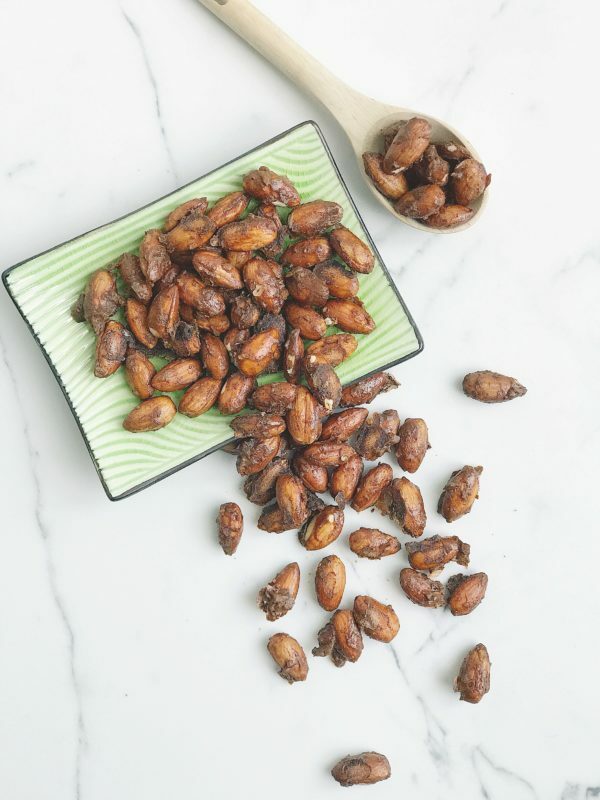 Lay almonds on a flat surface and air dry for 1 hour. Blend medjool dates, tamari, garlic, and ginger on high until it becomes a paste. In a medium bowl toss the almonds and paste together until well coated. 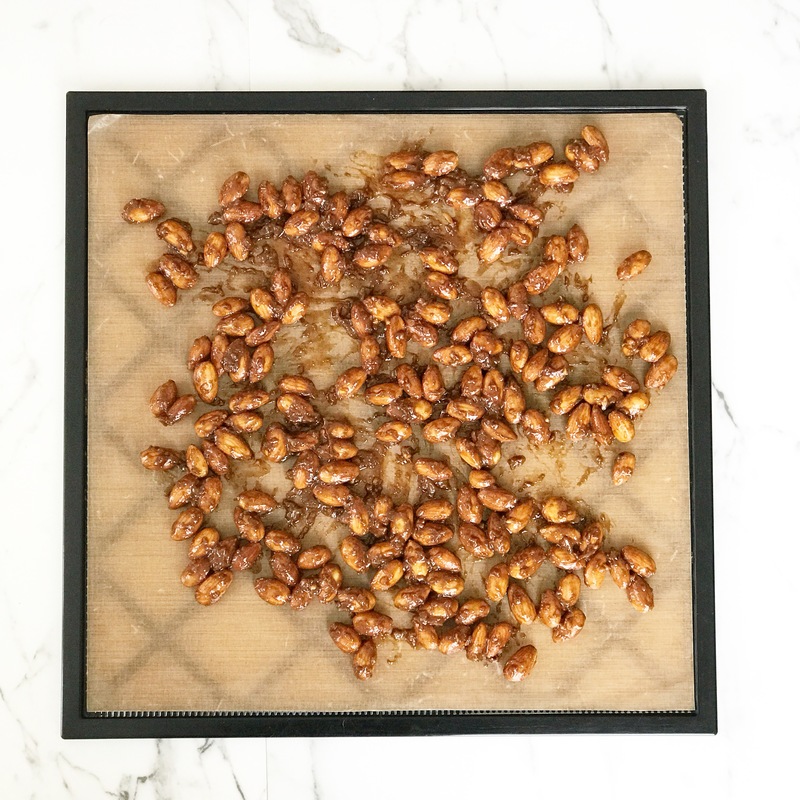 Using a dehydrator grid with a teflex sheet, spread the almonds in one layer making sure there is space between each almond. Dehydrate almonds at 145°F for 1 hour. Reduce heat to 115°F and continue to dehydrate for 48 hours. Let cool before removing from sheet. Refrigerate to keep fresh longer.